A version of this story first appeared on Trees of the Mind. The first Gulf War began on Aug. 2, 1990. I was about to begin the 10th grade. I had become a little hippie, wearing tie-dyed shirts, saving whales, listening to R.E.M. and worshiping Abbie Hoffman. For my 15th birthday that October, I had received my first political T-shirt. It said, "Love the Troops -- Hate the War" with a big peace sign around the whole works. My uncle had come back from Vietnam with a hole the size of a softball in his chest and a matching scar that covered his entire back on the other side. He didn't talk about the war, but he had stayed on to become a helicopter training pilot in the Army for a long career as an officer. He went to Walter Reed about the time the Gulf War started and they told him he had a 40-60 percent chance of living if they tried to take some of the thousands of staples out of his body. I hated the Vietnam War in retrospect and aimed to do the same for this little Atari war happening on my watch. I was young and radical and ready for a fight. There were very few protests. I felt like I needed to do something, so I wrote about six letters "To Any Soldier," determined that our generation would get it right. I would shove the flower in the gun, but I would do it while supporting the soldiers. I got replies from three soldiers. Their names are so common that I can't find them now -- Toby Summers, Chris Dunn and Rick Brooks. After I got the replies, I contacted the USO to ask how to send them goodies. In that pre-9/11 world, we could send food and treats to the soldiers without much screening. The only instruction was to not wrap anything in newspapers (censorship!) and not send chocolate because it melts. I sent each of the three men four dozen of these peanut butter cookies. 1. Preheat oven to 350°F and grease cookie sheets. 2. Using a mixer on low speed, mix peanut butter and sugar together until smooth. Beat in the eggs, one at a time, then stir in the baking soda, salt and vanilla. Roll dough into 1-inch balls and place them 2 inches apart on the prepared cookie sheets. Press a crisscross onto the top using the back of a fork. 3. Bake for 8 to 10 minutes. Allow cookies to cool on baking sheet for 5 minutes before removing to a wire rack to cool completely. It was simple – I didn’t even need my mom to help me very much. The response I received was overwhelming. Toby’s commanding officer told him that he wasn’t allowed to have any more of them unless I made enough for his whole unit. So, I sent 400 cookies packed between wax paper and bubble wrap in the box I got my first stereo CD player in. It made it to Saudi Arabia two days before Christmas. 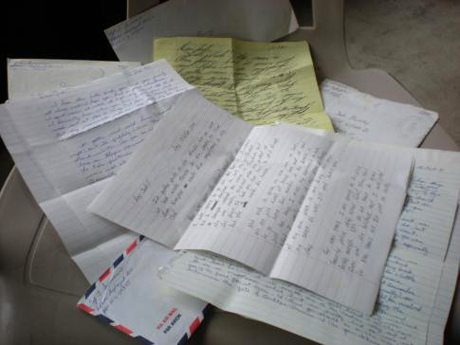 Seventeen soldiers wrote to thank me and I got the photo above from Toby. 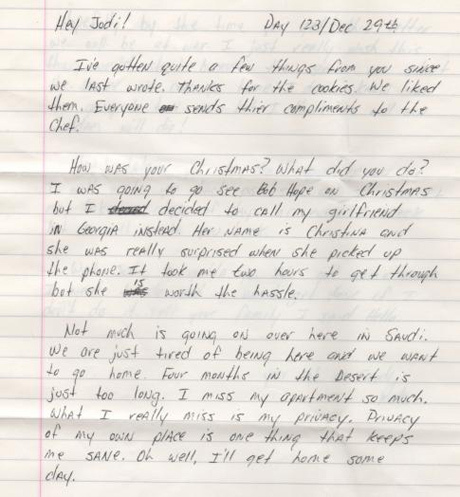 I’d like to share parts of some of their letters. My favorites came from Toby (Mr. RedHead above). He drew Calvin & Hobbes cartoons for me. Calvin says, "What a nightmare. 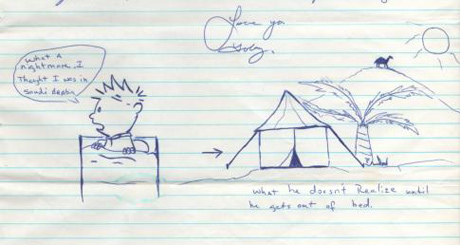 I thought I was in Saudi Arabia"
Under the tent: "What he doesn't realize until he gets out of bed." I started sending things to the soldiers out of a sense of frustration. I wanted to lie down in front of tanks and burn my nonexistent draft card. Those days were over, but my communications with the soldiers made me want the war to be over even more intensely. Today, we don’t really remember the old attitudes about soldiers being "baby killers" and violent thugs. But, what I found was that these were boys -- not a one over 23 -- who had signed up for a job they thought they would never have to do and they were just like me. They liked the same television shows and listened to Nitzer Ebb, Skinny Puppy and Ministry. They were just guys. Each night, I called a 1-800 number to listen to the names of those missing and killed in the war for that day. I said a little prayer, hoping that none of "my" boys would be on that list. They never were. There is no tear-jerking ending to this about a fallen soldier. Toby, Chris and Rick are just men out in the world now, pushing 40. I don't know where they are, but the cookies I made left me with feelings that have nothing to do with a yellow ribbon or nationalism. "Support Our Troops" should be more than a slogan slapped on the bumper of an SUV. Two hundred and ninety-four American soldiers died in the first Gulf War. To date, 4,685 American men and women have died in Iraq. One thousand five hundred and thirty-four have died in Afghanistan. Countless others have been injured. Hundreds of thousands of civilians have died in those countries. Yet, the impact on our lives, unless we have a friend or family member in the military, has been minimal. My voice is small but I'll keep saying bring them home and support them when they get back. Nineteen Christmases later, 30,000 more Tobys are on their way to Afghanistan. Learn how to send them some cookies by clicking here.